It seems as though a new “super” beauty ingredient debuts every week. And while many of those ingredients work, there is rarely one that tackles every beauty need and more. Or so it was until the discovery of skincare oils—specifically grape-seed oil—changed the game. Grape-seed oil, a common food ingredient and all-natural skincare product, is extracted from grape seeds after they have been used to make wine. Like our other favorite natural beauty staple, coconut oil, grape-seed oil contains linoleic acid and plenty of antioxidants that do the face and body good. Unlike coconut oil, however, grape-seed oil is non-comedogenic, meaning it does not clog pores, so even the most sensitive of skin types can use this oil with abandon. Whether you prefer to add grape-seed oil to your salad or slather it on your face, there are many a health and beauty benefits that come from this all-natural ingredient. From fading scars to promoting hair growth and tightening skin, keep reading for all the reasons you should add grape-seed oil to your beauty routine. Grape-seed oil is an effective and cost-friendly alternative to eye cream. Being that grape-seed oil contains vitamin E, an ingredient commonly found in expensive eye creams, as well as moisturizing fatty acids, it’s no wonder it works to fade even the darkest under-eye circles. 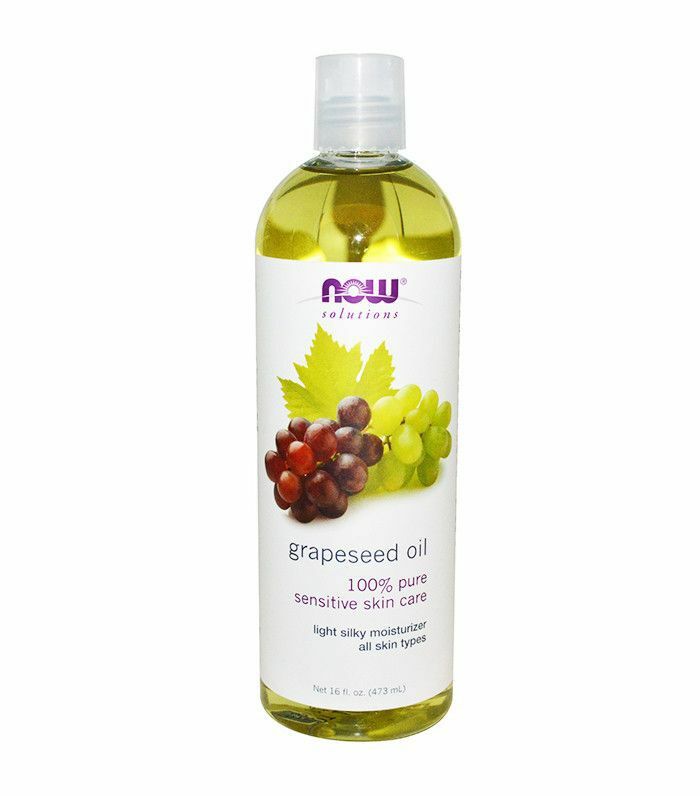 Grape-seed oil is rich in antioxidants, fatty acids, and vitamins that aid in hair health. While grape-seed oil excels in delivering hydration to strands, it has also been proven to lower DHT (dihydrotestosterone), a common culprit in male and female hair loss, thus promoting hair regrowth. Needless to say, grape-seed oil is a powerhouse for your tresses. Being that grape-seed oil has anti-inflammatory properties, contains high levels of linoleic acid, and doesn’t clog pores, it is a commonly used moisturizer for acne-prone and sensitive skin. While many oils tend to leave behind a residue, grape-seed oil instantly dries upon application, making it a great base under makeup. Not only is grape-seed oil rich in vitamin E, which has been proven to lessen the severity of scars, but it also contains linoleic acid, an essential fatty acid, proven to speed up the healing process as well as decrease the formation of keloid scars. Whether applied to the skin or consumed, grape-seed oil has been proven to protect against the sun’s harsh UV rays. Being that grape-seed oil, contains PTO’s (proanthocyanidin), strong antioxidants that fight free radicals, it both lightens age spots and aids in the prevention of sun damage. The many antioxidants found in grape-seed oil reduce inflammation and leakage in veins. Meaning if regularly applied to the affected area, grape-seed oil will likely alleviate the appearance of spider veins and/or varicose veins. Science says that the strong antioxidants (PTOs) in grape seeds increase collagen production, thus reducing the appearance of fine lines and stretch marks. When applied to the skin or taken via a supplement, grape-seed promotes healthy youthful looking skin. Want to give grape-seed oil a try? Scroll down to shop this all-natural super-ingredient. Thinking about adding oil to your beauty routine? Here's everything you need to know about oils.